Nicotiana is an old garden favorite, generating renewed interest. Very free flowering in a rich array of colors, with a light evening fragrance. 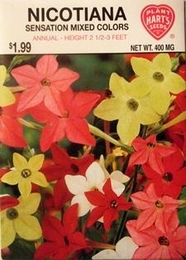 Nicotiana Sensation plants do best in rich soil, in light shade or full sun. Thinning - when plants are 2-3 inches tall thin to 10-12 inches apart.